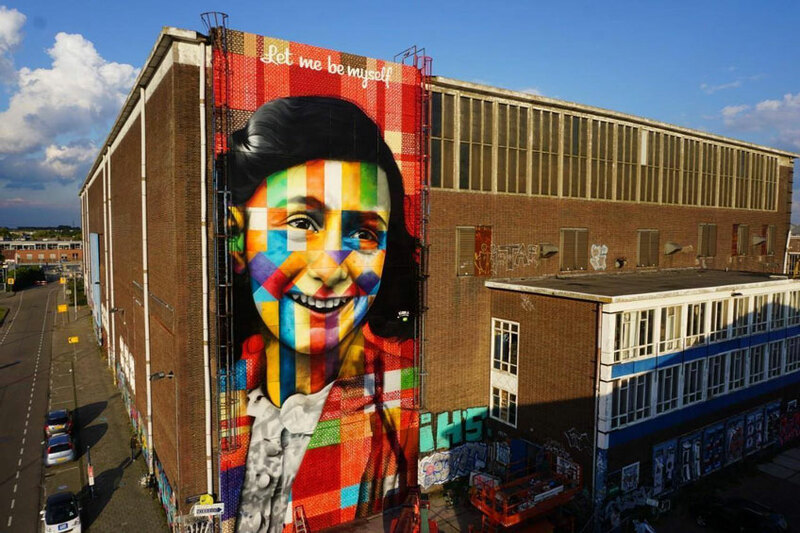 The door to the welding shed is decorated with a 240m2 mural of Anne Frank, painted by world-famous graffiti artist Eduardo Kobra from São Paulo. Over the years, Kobra has built up a striking oeuvre of giant, colourful portraits of icons such as Nelson Mandela, Albert Einstein, Malala Yousafzai and Ayrton Senna. With this work, the artist makes us aware of the worldwide attraction of Anne Frank. For example, her diary is the most-read book among young people in Brazil. This makes her message of resistance, hope, freedom and courage a powerful symbol against dictatorship, oppression and war all over the world. Let me be myself was created following an invitation from Street Art Today and Stichting NDSM-werf in cooperation with the City of Amsterdam and Instituto Plataforma Brasil from Brazil.